The training and skills guru talks to World Coffee Portal about Klatch Coffee’s holistic approach to skills in the supply chain, how technology is enhancing customer experience in-store – and is there a limit on what consumers will pay for speciality? It’s a quarter of a century since Klatch Coffee served up its first cup of Joe. Since then the team have picked up numerous accolades, including World’s Best Espresso at the WBC in 2007, Best Coffee House in America, 2012 and Overall Champion in Golden Bean North America Roaster Competition, 2015, 2016, 2017, to name but a few. It’s an impressive track record from the family-owned business, which has grown into major hub for coffee training and skills in the US. Today Klatch operates three retail sites across California, an outlet at LAX Airport and an international site in Seoul, Korea – with plans for further US expansion by the end of 2018. The wholesale roastery business supplies three continents worldwide while Klatch’s SCA-certified training and roasting lab offers classes on everything from espresso basics, latte art, competition training and Q-grading. And as Klatch has grown, so to has the speciality scene: “Honestly, it doesn’t feel like the same industry,” says VP and Director of Training & Consulting, Heather Perry. Reflecting on the development of Klatch and the industry as a whole, the two-time US Barista Champion is full of praise for speciality coffee’s ability to continually inspire consumers. “We didn’t see customers saying, “I want more speciality coffee. Coffee offers presented something new and drew customers to them,” she explains. And where speciality coffee generated demand for speciality coffee, it laid the foundations for a countless coffee careers throughout the supply chain. But while we hear much discussion about training and skills in the coffee shop, Heather says the production end of the supply chain is too often overlooked. In other words, if a barista in California is to thrive, then so to must coffee producing communities at origin – a dynamic that is fundamental to speciality’s ‘bean to cup’ narrative. “We don’t talk about how we can make it more sustainable for the farmers to actually be able to stay on their farms and grow coffee. This is the serious reality – it’s great to talk about the barista wage, but we also need to talk about where the farmer fits in. Baristas only have a job as long as there’s coffee we can sell,” says Heather. Along with fellow US roasters, Intelligentsia and CounterCulture in the USA, and Union in the UK, Klatch was an early proponent in the growing movement toward Direct Trade in speciality coffee. This enhanced scrutiny is adding value across the supply chain, not just for producers, but for employees and consumers as well. Klatch Direct Trade Coffee must have a minimum cupping store of 85 points, with farmers paid a minimum of $1.75 per pound and 25% above the Fairtrade market price. The result is higher quality coffee that commands a better price and supports jobs at both origin and consumption. But Heather is also realistic about the costs of improving employment and quality standards across supply chains. One thing’s for sure – the price for a cup of speciality coffee has risen significantly in the 25 years since Klatch first set up shop – but it’s a price that increasingly sophisticated consumers seem willing to pay as the industry adds value to its proposition. Allegra research identifies premiumisation as a key consumer trend in both the US and Europe, but is there a limit to what people are willing to pay? “You can talk to anybody who’s selling a $12 or even $50 cup – those are few and far between and not what people are spending every day. I think over the next few years we’re going to start seeing the cap that customers are willing to pay for their everyday cup of coffee – but I don’t think we know the limit yet,” says Heather. Rising wholesale costs, rents and wages mean coffee shops are seeking to broaden their menu appeal throughout the day and Heather notes the move toward premium food as one of the biggest trends in the coffee shop sector currently. While Klatch recently broadened its breakfast and lunch menu, other prominent independents such as Oregan’s Proud Mary and New York’s Bluestone Lane are also extracting value from untapped day-parts with a heavier emphasis on food. “$5 cups just aren’t sustainable for a lot of businesses and it’s hard for the average coffee shop to make a living from serving 200 customers a day. But if you have a decent food menu in the $7-12 range, you’ve essentially just doubled your ticket average,” she says. While there’s much debate on how the industry can best train and retain talent, Heather says keeping the best people on board isn’t just about increasing wages – it’s about creating viable career pathways that create real opportunities for personal development. “The barista is never going to be a lifelong position – and that’s ok. Just like being a sous chef – you want to move up – you want to move into the chef position, you want to move into being a restaurateur. Technology has also brought huge development in the coffee shop arena, and it’s something that Klatch is fully embracing. From using an automated Poursteady system to enabling greater menu customisation through mobile ordering, Heather says technology is most powerful when deployed to enhance customer experience in-store. “Nobody’s losing their jobs – I’m bringing in automation to make the brewing process more efficient and productive – that’s absolutely the reality,” she says. One area that’s proved particularly popular among customers is mobile ordering. According to Heather, Klatch’s app marks the company’s biggest adoption of tech to date. “It’s enormous from a flexible service experience and how you integrate it is key,” she explains. Convenience may be the primary driver behind mobile ordering, but Heather reports customers are thrilled with the ability to customise their orders. What’s more, digital menus are introducing customers to different product combinations, such as dairy alternatives and new food items they may have overlooked during their normal routines. In doing this, Heather says cafés get the “keys to the kingdom” to enhance in-store in experience and broaden menu appeal. And while Heather’s not quite ready to swap her beloved Simonelli Black Eagle for the Braintree automatic they’ve been testing in-store, automation is going to play a big role in Klatch’s future. Judging by Klatch’s success, it’s a resounding thumbs-up – here’s to the next 25 years. 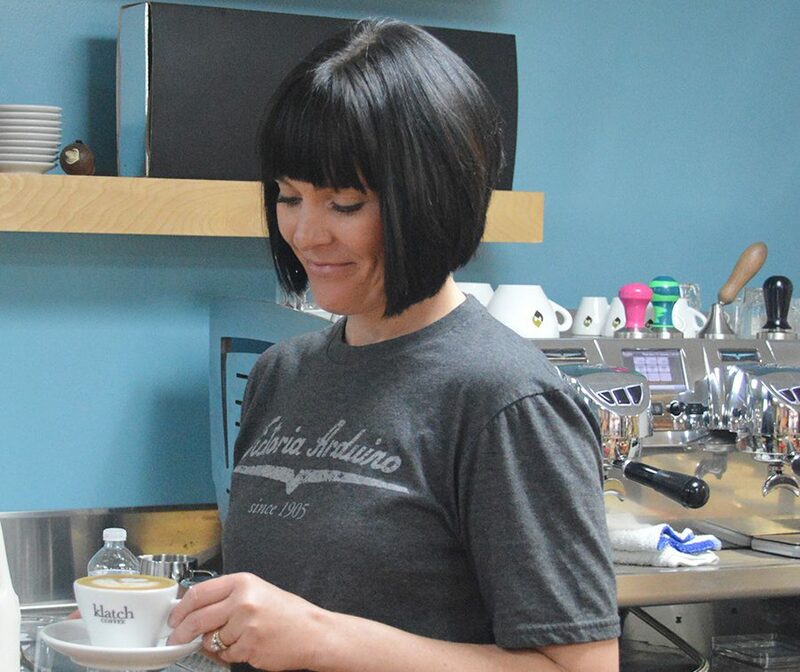 Heather Perry is VP and Director of Training & Consulting at Klatch Coffee. Heather joins World Coffee Portal as a guest panelist at the CEO Forum on November 8, 2018 in Los Angeles.